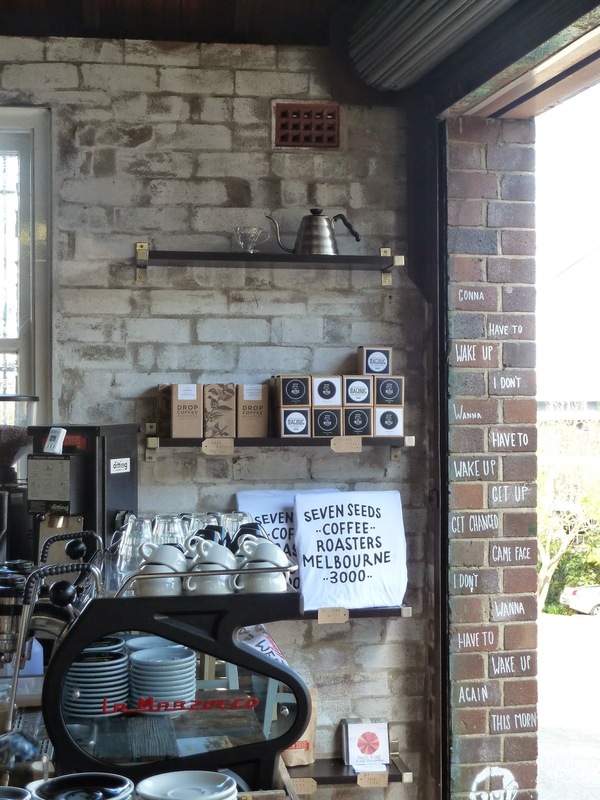 Broadsheet Sydney recently published an article about a new cafe in Pymble. It caught my eye and I made plans to check it out over a few visits. On my first visit, I had breakfast. My choice was The Little Soldier - 62 degree egg, asparagus and soldier toasts. The egg was perfectly cooked and the asparagus was nicely blanched and had a lovely bite. For my personal taste, I would have liked a sprinkle of salt but taste wise it was quite delicious. Loved the egg oozing all over the toasts. And I liked the plating. The coffee of choice at Maslow's is Seven Seeds and I had a skim cappuccino to kick off my day. I found it slightly weak on my first visit but on my next visit, it was a stronger brew and sat much better with me. Let me start by saying I tried to be lady like and used my cutlery. That was a huge failure on my part as the wonderfully dense brioche did not take to the knife. So I resorted to using my hands and eating it like I would a burger and it got all yummily messy!! The pork was tender and delicious, the egg was once again oozing all over the bun but it was such fun eating this way. I absolutely loved the texture of the Sonoma brioche! 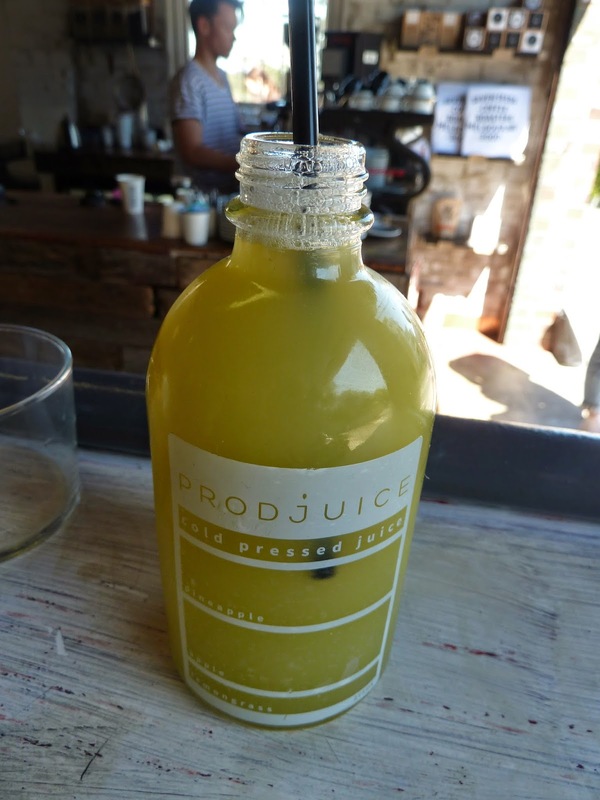 This time I had a cold pressed juice of Pineapple, apple and ginger. It was very refreshing. On my third visit, I decided to have Smoke on The Water. This was house smoked trout, with pea soup, beetroot cured egg and drizzled with chorizo oil. What a pretty looking dish. The trout was lightly smoked, the pea soup was slightly sweet and the boiled egg with a slightly soft yolk looked pretty in "pink". I actually enjoyed this unusually named dish, it was different from the normal breakfast dish. They also have an array of scones, Cronuts (from Brewtown), friands and mini chocolate cakes which are baked by a local lady. The chocolate cakes had such a lovely gloss of chocolate icing. The other sweets are baked in house. The range of cakes changed slightly on my 3 visits. They have been open for only 6 weeks but people are definitely aware of this little cool place. On my second visit it started to get very busy around noon and there was a tiny queue for a table. Do check it out, I think you will like it! I've been told there will be some menu changes in the next week or so. P/S If you do decide to check it out, I would suggest you turn into Livingstone Avenue from the Pacific Highway as the garage is located right across a block of apartments below the highway. woah that mr pig looks awesome! Hi chocolatesuze, it was rather delicious! Wow smoke on the water looks amazing!